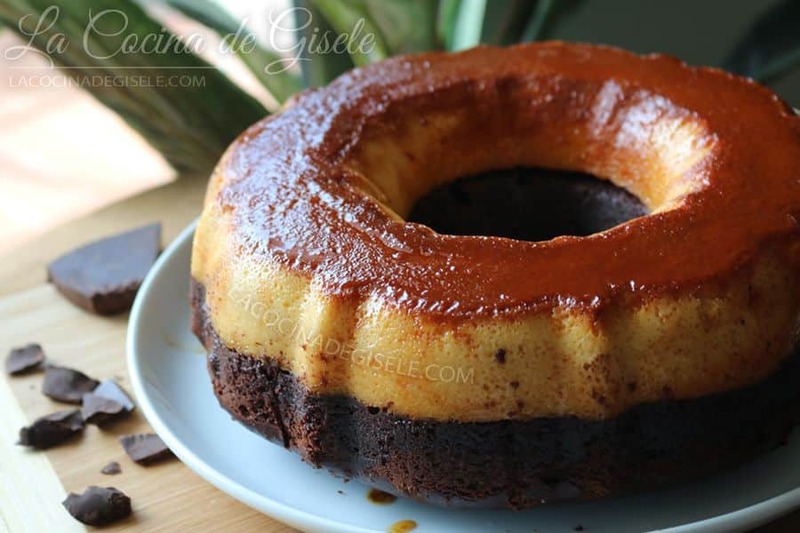 From the blog Las Cocina de Gisele we bring a spectacular cake (chocoflán) that combines a base of chocolate sponge cake with a top layer of flan, or quesillo, covered with caramel. The recipe is simpler than it may seem and the result is, as we can see in the images, totally spectacular. We will beat by hand in a large bowl or blender as you prefer the 5 eggs, the condensed milk, the same measure of the condensed can in whole milk and the vanilla spoonful. We will add this mixture to the mold where we have emptied the caramel that by now is cold and hard. We will bake at 220ºC for 20 minutes this quesillo at Bain Mary, this is important so that it does not burn on the bottom or on the sides and it looks nice, while it is baking we are going to prepare the chocolate cake mixture. Easier impossible, all we have to do is mix all the ingredients by hand in a bowl and that's it. Is not it a wonder? It seems incredible that the simplest is the richest. Well this is the case of this cake .. when I do it alone I cover it with nutella and I give myself life! After 20 minutes of the quesillo (flan) in the oven, remove it and add the mixture of the chocolate cake with care that it does not fall very abruptly and with a spatula we will spread it well throughout the mold so that it is uniform. We return to the oven equal to 220ºC bain-marie. If the water was consumed, heat a little more and add it. We will bake between 40 and 45 minutes maybe a little more or a little less depending on your oven I always say they are not all the same. It will be ready when a stick comes out dry. We remove the cake from the oven and let it cool for an hour on a rack. Then with a knife very carefully we introduce it by the sides of the mold to take it off a little if it is necessary. We now place a large plate on it and we will turn around quickly. We arrange it a little so that it is in the center of the plate and we will tap the mold just in case it is released, we take out the mold and voilà! we already have this preciousness that will leave everyone delighted. 0 Response to "CHOCOFLÁN "